An innovative Corvette-trimaran, ‘Rusich-2400’, was unveiled at the St. Petersburg Naval Show in 2015. The vessel is now merely a prototype, but its developers are convinced that the trimaran has a promising future and this unique corvette will be useful not only for the military, but also for emergency services, oil, gas and environmental enterprises. “The Americans are already building warships of this type, the English have been building them, even the Chinese have them in service. Here in Russia, the question of military use of trimarans is in the discussion stage. ... Our company - Zelenodolsk Design Bureau continues to develop versions of combat trimarans, we already have about 20 preliminary designs,” Stanislav Rudenko, chief designer of multihull vessels and ships at JSC Zelenodolsk Design Bureau, told ‘Zvezda’. Trimaran is a boat with three interconnected hulls. It features high level of stability and seaworthiness. Single-hull ships are inferior to trimarans in seaworthiness, safety, habitability and armoury. Trimaran first appeared in the Soviet Union. The invention has been patented and served as basis for a number of warship creating concepts. “The innovation of the design of our trimaran consists in having located the engines outside the main hull, on the side ‘floats’, called outriggers, due to their unconventional shape. Both their shape and size are fundamentally different from the side hulls of traditional trimarans,” Rudenko said. Testing a number of models has shown that, in comparison with single-hull boats, during a Force 6 storm, the roll amplitude is reduced by 5-6 times, vertical overload by 2.5-3 times. According to the head of the combat trimaran project, the habitability of his ship enters a qualitatively new level. "Liberating the hull from the engines causes a chain reaction of important positive effects. It enables taking aboard the ship 1.5-2 times more payload (arms) without increasing its size,” Rudenko said. The most advanced of the two dozen preliminary designs of Zelenodolsk DB is Corvette Rusich-1500. This ship is designed for combating surface, underwater and air enemies in the coastal and ocean areas, setting minefields, radio reconnaissance, search and rescue operations. 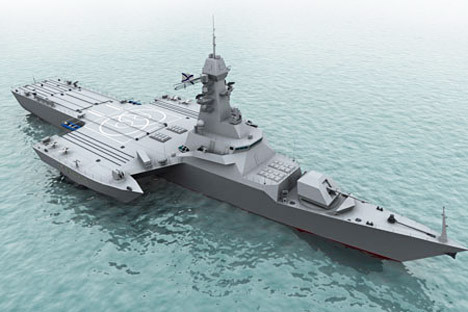 The chief designer of the projects at Zelenodolsk Design Bureau Alexey Kharitonov told Zvezda about the weapons and the advantages of this battle trimaran. Corvette Rusich-2400 has two helicopter docks for helicopters Ka-28 (Ka-31), shock weapons of ‘Club’ type missile, SAM of ‘Redoute’ type, 130 mm artillery guns, powerful anti-submarine, sonar weapons and mine weapons. The boat can carry four UAVs. In 2011, trimarans were positively assessed and recognized as promising warships for use as water patrol corvettes. However, 3 years later, the Russian Navy Command abandoned the concept of patrol corvettes in favor of ​ patrol ships; with fewer arms but with greater autonomy and flexibility, including the ability to perform long distance sails. This decision again determined the fate of Russian military trimaran. But the trimaran features claimed by Zelenodolsk designers and confirmed by numerous tests raise hope that innovative domestic designs will be included future research and development activities. The article is abridged. Read the full version here.